The science team has been working in the waters off Thera for four days. They have been using the remotely operated vehicles -- Argus and Hercules -- to look at rocks and other materials on the seafloor up close. They have also been collecting rock samples to bring back to the surface. How did they know where to look? This is not the first trip to Thera. Many of the scientists were here on another ship, the Aegeo, just last month. They used tools like sonar to make detailed maps of the seafloor around Thera and inside the caldera. One of the goals of last month's expedition was to look for places that they would come back to look at with the ROV Hercules. What have they seen? The science team found large blocks of rock lying on the seafloor. Some of the blocks are as long as two football fields. The team used Hercules to take samples of the blocks to find out what they are made of and perhaps how they got here. The team is also very interested in layers of material that sits on the top of these large blocks. These layers may contain material from the eruption of Thera about 3600 years ago. The island of Thera is covered with different layers of rocks and other materials that help us to understand what happened during the eruption. 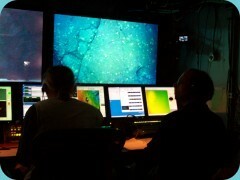 However this expedition is the first time that scientists have been able to closely study these layers under water. The team also went to the Kolumbo underwater volcano which is to the northeast of Thera. There they discovered a field of hydrothermal vents. These are places where seawater goes into cracks in the seafloor and gets heated by hot rock from the volcano. The places where the hot water comes back up through the seafloor are called hydrothermal vents. These vents are sometimes marked by structures that look like chimneys, which are formed from minerals dissolved in the hot water. You can read more updates from the science team in their own words on the Thera expedition website at the University of Rhode Island.